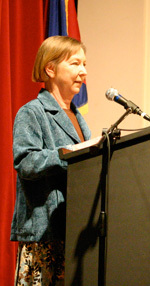 Valerie Martin is the author of three collections of short fiction, including The Unfinished Novel and Other Stories; several novels, including Tresspass and Mary Reilly, which was made into a movie with Julia Roberts and John Malkovich; and a nonfiction work about St. Francis of Assisi. In this recording from the 27th Key West Literary Seminar, Martin reads from her Orange Prize-winning historical novel, Property. Set on a plantation outside New Orleans in 1828, Property is narrated by Manon Gaudet, a slaveowner whose husband has fathered two children with one of Manon’s slaves. In the passage presented here, Manon meets with her brother-in-law following an insurrection in which Manon has been shot in the shoulder, the slave has run away, and her husband has been killed. This recording is available for noncommercial and educational use only. All rights belong to the author. © 2009 Valerie Martin. Used with permission from Valerie Martin.